I know that after all the Christmas excesses, especially sweets topic, one does not feel like baking cakes and much others follow.. But as soon sure will have a birthday or celebration I leave this idea to make the cake, to see if the love. I did it for my niece's birthday, Lucia, along with another that will teach you a few days. As you prepare and how, although before, you me permitíes, congratulations again and from here to the girl's family…..Luci Felicidadades! Prepare a mold 18 cm. in diameter, desmoldable, greasing and forrándolo with baking paper. We serum or Buttermilk. To do this we take a tablespoon of lemon juice (or white vinegar) in 250 ml of skimmed milk semidesnatada, and let rest about 10 minutes at room temperature. Melt butter, and chocolate, instant coffee and water. Mix flour, baking soda and cocoa, and sift. The mix with sugar, and reserve. Beat the eggs with Buttermilk. I got together with the chocolate mixture. I pour everything into the flour and mix and beat well until a smooth cream. We took the previous prepared pan and bake, precalenado oven at 160 º C. about 90 minutes. Once out of the oven, after a few minutes, desmoldamos the cake and let cool on a rack. To prepare the filler and the cover, Fire put cream and sugar, and warmed to boiling point. Remove from heat and add the chopped chocolate. Mix until creamy and let stand a few minutes until cool and slightly thickened. To make chips (or beads, if you have a lot of skill), Melt chocolate on marble and extend. Once cool, with the aid of a spatula, scratched the surface, continuously and not very deep, to be forming chips or beads. This way you can skip it if you find in the supermarket.. o, simply, garnish with grated chocolate. We put the chocolates as a crown on top, and the chocolate chips in the center and bottom of the cake (here you can put more if you like and chocolates). Let rest in the fridge. 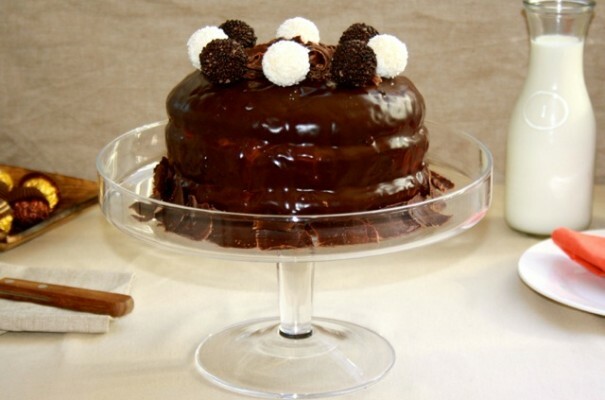 If you like chocolate, This is a cake that you must try, I assure. The cake is very moist, really delicious, and the final combination of all, with strawberries, chocolates.. Spectacular!